In her astounding debut novel, Palacio’s Wonder illuminates on the importance of acceptance and self-discovery at an age where we are still trying to determine who we are and where we fit in the world. Following the lives of Auggie Pullman and those close in his life, this coming of age novel truly uncovers the trials individuals go through when the world appears against them. A true work of art, Wonder will take you on a roller coaster of emotions within the first few pages of the novel. Will Auggie discover what true friendship is? How will the characters cope with their inner turmoils? I picked this book as part of the POPSUGAR Reading Challenge, for one of the challenges is picking a book which has a film coming out in 2017. I had a good feeling about this book before I even read it by the reviews, the aesthetic of the book cover, and the story it had to tell. Palacio’s Wonder impressed me far beyond my original expectations! I finished this in a day and was devastated when it was done simply because I wanted more! Books like this make me tremendously happy that I’m a book reader and that authors like Palacio exist! This book touched me in ways that I haven’t felt in a long time from a novel. One minute I was full of smiles… then I was in absolute tears…then I was furious…then I would end up hysterically laughing. There are so many important life lessons to take from this novel, I feel as though this should be a mandatory read in elementary or high school English curriculum’s. I had a hard time staying objective in this review, but I hope that the little snippets of my own experiences further emphasize how wonderful this novel really is. The story is about August “Auggie” Pullman, a boy born with a facial deformity that is now entering school for the first time in the 5th Grade. Throughout the story, we are introduced to a number of obstacles Auggie must face. Bullying, discrimination, self-doubt and loathing, isolation…Auggie’s trials are definitely a handful for such a young boy. However, it’s through these battles that Auggie begins to learn more about the kind of person he wants to be and how beauty comes in a number of ways. His optimism and strength are such inspiration, you begin to feel a sense of encouragement to find the light in your own life. In order to execute this properly, Palacio uses multi first-person narration to place us further into the lives of all these characters. 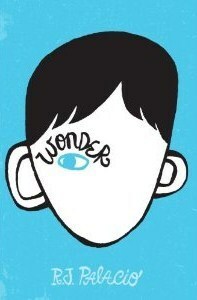 I’m not typically a fan of multiple narrators, but I don’t think Wonder would have been as remarkable if it was only in Auggie’s point of view. It’s through this narration style that readers are able to fully grasp how characters are feeling with their own challenges. One POV that resonated with me the most is Olivia “Via” Pullman, Auggie’s older sister. Via loves and accepts Auggie in the most beautiful and touching way imaginable, caring and protecting him in the best way she can…but she’s not perfect. In her new high school, Via struggles with friend changes and for once wanting to not be the girl with the “facially deformed brother”. She wants to be seen as a normal girl with a normal family, which causes her immense guilt and anxiety. Coming from a household with a brother who’s been diagnosed with low functioning autism, I completely felt her pain and cried along with her. It’s content like this that makes Wonder a magnificent piece of literature. Palacio doesn’t sugarcoat it…she unmasks the truth, uncovering the good and the bad and the ugly sides of humanity. What I found even more brilliant is the change in writing style as the narration switched. Each character has their own voice, making you really feel the changes in the characters. Palacio even went to extremes such as changing the sentence and grammatical structure to emphasize the character change. I felt so much more connected to each character’s’ story due to small details such as this – her writing is truly genius. But what I truly loved is the emphasis on how there is more beauty in the world than darkness. Wonder shows what one small act of kindness can do, changing the motion of the world. Humans are funny creatures, full of grand surprises. Palacio highlights on this through the remarkable friendships Auggie makes and the beautiful family dynamic of the Pullman’s. Life is truly beautiful, especially when we learn to look beyond ourselves and the physical world. This novel shows there’s no such thing as purely good people and purely bad people – we are all imperfect beings in a very imperfect yet magically wonderful world. If the story alone doesn’t pull you in, the abundance of beautifully written quotes regarding life lessons and inspirations will definitely provide you with joy. If Palacio’s Wonder is not already on your TBR list, I strongly encourage you to add it and read it as soon as you possibly can. It’s a charming, fast-paced read that is a joy for all ages. Jenna, the way you describe this book captures EXACTLY what I love about it! My daughters and I read it together, out loud, a chapter a night – and all three of us laughed, cried, really FELT for each character in some way or other. It gave me a little window into the lives of families who have a member who struggles with unique challenges. It gave my girls a little more empathy, not just for victims but for bad guys, too. And, in a world obsessed with the physical – with what you can see – it was a chance for us to talk about what happens when conventional beauty is stripped away to expose what’s inside. We can’t wait to watch the movie! I love that you read this with your daughters! I think it’s a perfect book to demonstrate how we all live such uniquely different lives and all face our own challenges. It’s also beautifully written! I love how the end of the book lists all the special quotes that their one teachet posted each month. It’s such a wonderful story. I can’t wait to watch the film either! I’m so glad you all enjoyed it! Awe I’m so excited! Please let me know what you think!! !